A man faces an unexpected journey. "A soldier finds out what happens after death." The first short film by Irish artist Ruairí Robinson features a minimalistic mise-en-scene, one character, an emphasis on objects and an internal conflict. Staged in particular versions of purgatory, heaven and hell, conceived with dry humor, the plot evolves in a series of repeated cycles. The stylized aesthetic with realistic illumination was a pioneering one at the time (2001), as it was the first prominent CG short film to use global illumination techniques to achieve realistic lighting. 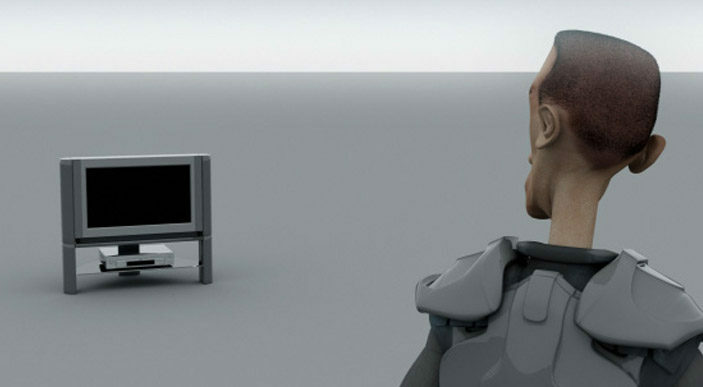 The filmmaker used an early version of Marcos Fajardo’s Arnold Renderer. The film’s title, as well as the clearly divided landscape through a horizontal line, seems to allude to the images created during the early years of computer graphics.